I want to wish all the wonderful fathers a Happy Father's Day. 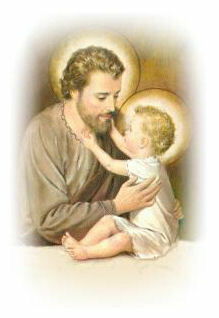 I especially want to wish our loving God and St. Joseph a very Happy Father's Day. And to my dear sweet Daddy, a very special Happy Father's Day. I wish I were there to celebrate with you and the rest of the family. I love you!! After a long bus ride, a young husband and wife were sitting at a dinner table with their baby. They looked tired and not too prosperous. Their clothes were wrinkled and their breakfast seemed too light. When the young husband received the check, his hand fumbled in his pocket and came up with some change. A look of dismay clearly revealed he didn't have enough to pay the bill. At a neighboring table, another young husband had been observing them. He walked up to the father, shook his hand vigorously--passing a slip of green paper with it--and said, "congratulations on your beautiful baby!" A grin of relief and gratitude shone on the young father's face. Two aspects of giving are illustrated in this story. One is that in giving we should give gracefully, with sensitivity for the feelings of the person receiving the gift. The other is to be able to receive gifts graciously. That's a knack that is especially appreciated on Father's Day when fathers need to recognize the expressions of love behind the gifts they receive. Father of All, help fathers everywhere to appreciate their fatherhood and see in it a reflection of Your love for us. Some of you may be familiar with Fr. John Catoir as the former director of the Christophers or from his syndicated column in our diocesan newspapers. I have blessed to know him as the pastor of our church when I was growing up in Paterson. Thank you Fr. Catoir for all your daily inspirations as I read your little books. Formally known as Corpus Christi. To commemorate this feast day, I would like to share a story someone shared with me. Thanks Sanju for this inspirational story of the Eucharist. On July 18, 1946, Father Gino C. Violini stood before a small wooden church in a little town nestled in the foothills of the Canadian Rockies in Southern Alberta. St. Joseph's was a forlorn, nearly-abandoned little mission church. A small group of people gathered around this man dressed in mourning. They said they didn't need a priest; Cowley didn't need a priest, and if it ever came to pass that they needed one, they would inform Bishop Carroll of the fact. Furthermore, they didn't want to see him reading his breviary, and he could get rid of that cassock. He celebrated his first Mass at St. Joseph's the following Sunday. There were nine people in the pews. Well, he had to start somewhere, and he delivered the best sermon ever, in his opinion, to those nine people. The following Sunday, there were only four who had come to adore their God. The next two years were not crowned with success. The collection was laughable. He could afford a loaf of bread which he'd cut into seven parts, one part for each day of the week, and feasted on dandelion salad. Winter is an especially cruel season in Cowley, and he'd find his blankets snow covered when he awoke in the morning, as the rectory walls were split open from the many seasons that had dried and shrunk the logs apart. His first Christmas collection was a dollar and thirteen cents. The church was no warmer than the rectory, so the water would freeze in the cruets, even though he placed them on a little coal stove. Father had had it. One day he sat down and wrote a sixteen-page letter, addressed to Bishop Francis P. Carroll, the gist of which was — this town is a write-off, and I want to stamp the dust of it off my feet. The Bishop rejected each and all of his requests for a transfer, and told him to stay put. He had full confidence in Father Violini, and he expected him to bring about a full Catholic revival in this parish, which had been so long neglected. After the latest of these rebuffs, Father was ready to pray for a noble death. But he was in for a great revelation. On the feast of Corpus Christi, he awoke early and headed for the church for morning prayers. As he walked to the church, he noticed the front door hanging off its hinges. He hurried in and gazed at a scene of great destruction. The walls were in shambles, the statues destroyed and then he noticed the tabernacle had been split open and the consecrated Hosts were scattered down the main aisle. One by one, he gathered them up, counting each one. They were all there except the large Benediction Host which he could find nowhere. It was raining, The gray sky reflected his anguish. He notified Father Harrington of the Crowsnest deanery who quickly organized a search party of some two-thousand people. They searched Bellevue and Hillcrest, Blairemore and Coleman; some came from as far as Michel and Natal in British Columbia, yet none of the people of Cowley would help. The search party combed miles of Highway 3. The Royal Canadian Mounted Police picked up two suspects at Cowley, and questioned them at Blairemore. They had stolen a pickup truck, and abandoned it down the highway when the police had discovered them. Father Gino recognized them as transients from Lethbridge who had been seated next to him at a baseball game a couple days before, and who were looking to find work in the coal mines at Crowsnest Pass. 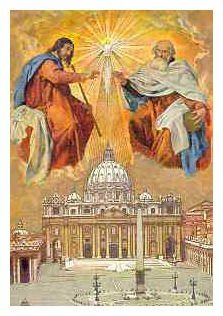 He listened to the questioning by Sergeant Parsons: “Remember, it may not mean much to you or to me, but you fellows stole his Jesus.” Father explained the meaning of the Blessed Sacrament to them, and how precious it is to Catholics. He then offered to drop all the charges if they would tell him where they had discarded the Host. Touched by his explanation, they began to show remorse and offered to help find It. One admitted to having discarded it through the truck window just before the police took them into custody. He didn't know what it was, but he knew it was incriminating evidence. The rain had hardly stopped when they all piled into the police cruiser, the two suspects still handcuffed. Father calculated that if the Host had been dropped as these two men had said, the search parties would surely have found it if the rain had not dissolved it. It was about six o'clock that evening when they arrived at the spot. The sky was clearing; there was a bit of blue in the West. As they rounded a corner east of Bellevue, they all saw the Host suspended in midair beside the highway. Beautiful rays of coloured light shone from it. Even before the car had stopped, Father leaped from the car and ran towards this astonishing sight. Sergeant Parsons was right behind him. Father fell to his knees in adoration, overcome with joy and wonder. Sergeant Parsons did likewise, and landed in a pool of mud. Sergeant Parsons came to ask for instruction a few days later. His wife and children soon joined him, and later two of his constables from Pincher Creek. As time went on, more and more Catholics began to return to their church. The parish mission was so popular that the beer hall shut down when it was in progress. The patrons, many of whom were not Catholic, would carry the bar stools to the church to listen to Father's sermons. They even had to take out the pot-bellied stove to make room for everyone. The little church, so long abandoned, was now full to overflowing every Sunday. Hat tip to Sue for sharing this. 1. Read the suggested Scriptural text slowly and reflectively the evening before; let the words settle in your whole being and become part of you. This remote preparation is conducive to prayer because the Word of God rests in the subconscious mind and conditions you for a personal meeting with Jesus the next morning. 2. Choose a place and posture for prayer which is relaxing. Taking a sufficiently long period of time to settle down and feel relaxed. If you concentrate on your breathing you will find it a good means of relaxing. 3. Be aware of the presence of God. As you breathe rhythmically pronounce the name of Jesus deep in your heart, not with your lips. This will prove helpful in bringing you into the awareness of His abiding presence. 4. Take up the Word of God and read it reflectively with frequent pauses to ascertain what message the Lord wishes to convey to you. Let it speak to you, a word, a phrase, an expression at a time. Rest with it. Let it sink into your whole being. Let it find a home in your heart. 5. Pray by listening and responding with love. Be for God and let Him be for you. Rest in His presence. A lover longs to be in the presence of the one he loves. God loves you and you love Him. Hunger for His presence as you await His personal message for you. Then respond to Him in love and gratitude as the Spirit moves you. 6. You will find it rewarding to keep a spiritual journal (a brief account of the highlights of your hour or prayer). A rereading of your journal from time to time will deepen the experience you enjoyed in prayer. This repetition will be extremely beneficial for your spiritual growth. O my Divine Master, teach me to hold myself in silence before you; to adore you in the depth of my being; to wait upon you always and never to ask anything of you but the fulfillment of your will. Teach me to let you act in me and form in me the simple prayer that says little but includes everything. Grant me this favour for the glory of your name. Amen. One of the changes that has made its way into the celebration of the Mass, is the Orans Posture. You will notice this during the prayer of the Our Father when the laity join the priest in raising their arms upwards or holding hands with the people next to them. Although it never bothered me to hold hands with my family, I still sensed that we should not be doing this. Well according to an answer posted on EWTN, we should not. The Orans position (Latin for "praying") or some variation of it, was common to almost all ancient religions as an outward sign of supplicating God (or if a pagan religion, the gods). Consider what we do when we plead with someone. We might put our arms out in front of us as if reaching for the person and say "I beg you, help me." This seems to be a natural human gesture coming from deep within us - like kneeling to adore or to express sorrow. Now, turn that reach heavenwards and you have the Orans position. The liturgical use of this position by the priest is spelled out in the rubrics (the laws governing how the Mass is said). It indicates his praying on BEHALF of us, acting as alter Christus as pastor of the flock, head of the body. It used to be minutely defined in the rubrics, which now say only, "extends his hands" or "with hands extended." Priests understand what is meant (from observation and training), and although there is some variability between priests basically the same gesture is obtained from all of them by these words. Among the laity this practice began with the charismatic renewal. Used in private prayer it has worked its way into the Liturgy. It is a legitimate gesture to use when praying, as history shows, however, it is a private gesture when used in the Mass and in some cases conflicts with the system of signs which the rubrics are intended to protect. The Mass is not a private or merely human ceremony. The symbology of the actions, including such gestures, is definite and precise, and reflects the sacramental character of the Church's prayer. As the Holy See has recently pointed out, confusion has entered the Church about the hierarchical nature of her worship, and this gesture certainly contributes to that confusion when it conflicts with the ordered sign language of the Mass. After Our Father. This liturgical disunity continues after the Our Father when some, though not all, who assumed the Orans position during the Our Father continue it through the balance of the prayers, until after "For thine is the kingdom etc." The rubrics provide that priest-concelebrants lower their extended hands, so that the main celebrant alone continues praying with hands extended, since he represents all, including his brother priests. So, we have the very anomalous situation that no matter how many clergy are present only one of them is praying with hands extended, accompanied by numbers of the laity. So, while we shouldn't attribute bad will to those who honestly have felt that there was some virtue in doing this during the Mass, it is yet another case where good will can achieve the opposite of what it intends when not imbued with the truth, in this case the truth about the sacramental nature of the postures at Mass and their meaning. 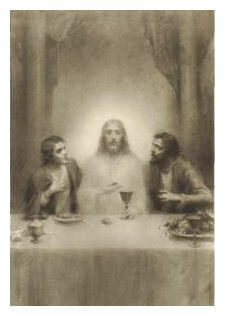 Picture from a Holy Card.